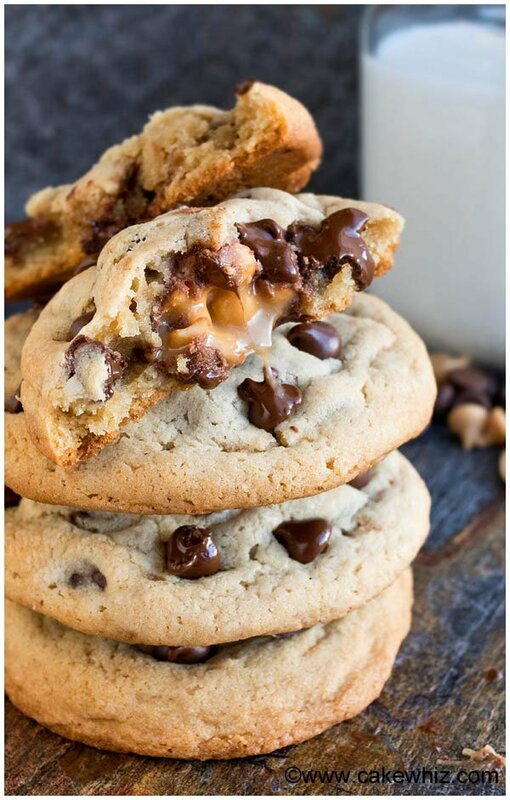 This soft and chewy salted caramel chocolate chip cookies recipe is easy to make and has an ooey gooey center. They are huge, like bakery style cookies! I make a batch of chocolate chip cookies pretty much every week but this time, I did something CRAZY and stuffed them with cashews and caramel. At first, I was going to use only caramel in the center but my dear Mom got me a big bag of cashews on her last visit. I personally enjoy munching on these easy caramel chocolate chip cookies straight out of the oven with a big glass of milk! They are so SOFT and warm and all the flavors intermingle in perfect harmony. By the way, these cashew caramel chocolate chip cookies were HUGE! They ended up being slightly BIGGER than the palm of my hands, just like bakery cookies! To be honest, I don’t even think it’s possible to make small cookies when you are stuffing them. Egg and butter must be at ROOM TEMPERATURE since it blends together more smoothly and evenly. Both, baking powder and baking soda, are used in this recipe. DON’T replace one with the other. Both, granulated and brown sugar are used in this salted caramel chocolate cookies recipe. DON’T replace one with the other. I used salted caramel but you can also use regular caramel candies, if you like. 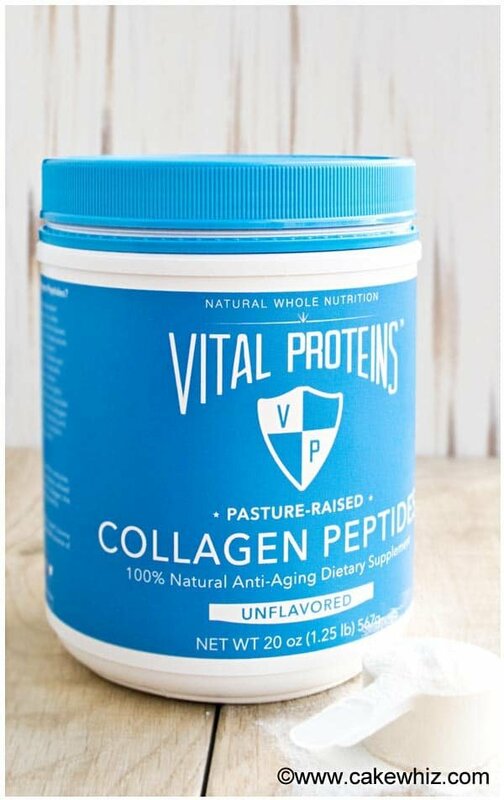 I like to add some collagen peptides to give these cookies a boost of nutrition. If you don’t have that, you can omit it. Once the dough was ready, I DIVIDED it into half and stuffed half the cookies with just salted caramel and another batch with caramel and cashews. They both tasted incredible. You can try stuffing these cookies with other nuts too like pistachios, pecans or walnuts. Recipe can easily be DOUBLED to serve a larger crowd. When the cookies come fresh out of the oven, push a few chocolate chips on top of each cookie before they have a chance to cool down. It just makes them look prettier and one can truly never have enough chocolate chips…lol. Leftovers can be STORED in a cookie jar at room temperature for up to 2 days. To make caramel chocolate chip cookie pie, prepare the chocolate chip cookie dough and spread it in an oven-safe pie dish and bake for about 20 minutes or until the edges are firm and golden brown. When the cookie base cools down, top it off with a caramel filling. To make caramel chocolate chip cookie bars, spread this cookie dough in an 8 inch square pan and push little caramel pieces into it (Use a pair of scissors to cut soft caramel candy into smaller pieces). Bake for about 20 minutes or until the edges are firm and golden brown. Once they cool down, use a sharp knife to slice bars. To make caramel pretzel chocolate chip cookies, stuff each cookie with caramel and a few pieces of roughly chopped pretzel sticks. To make chocolate chip cookies with caramel bits, stir in some caramel bits into the batter and omit stuffing the center. To make caramel chocolate chip cookie cups, spread the dough in individual openings of a cupcake pan and bake for 10-15 minutes. After removing the cupcake pan from the oven, press down the center of the cookie cups with the back of a spoon. Let them cool down. Then, fill each cookie cup with caramel filling. By the way, to give these sea salt caramel chocolate chip cookies a supplemental boost, I added Vital Proteins collagen peptides. I LOOOOOVEEEE this product…It’s odorless and colorless and won’t change the flavor of your recipes. I have been using it about 4 months now in my baking and cooking and I am starting to notice a difference in my nails and my hair => Everything is getting STRONGER and HEALTHIER! I have also used collagen peptides in these fudgy eggless brownies and this raspberry mousse and even these pistachio carrot cupcakes. 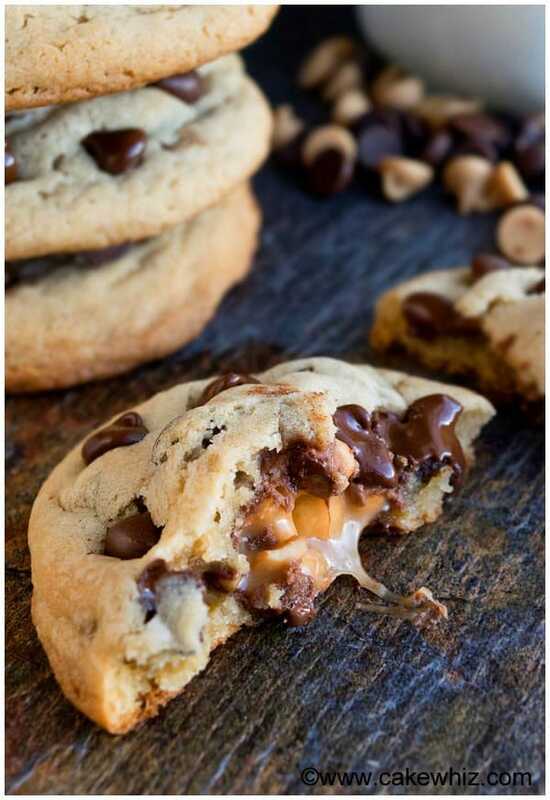 How to make salted caramel chocolate chip cookies? Start off by creaming together butter and sugars. Mix in egg and vanilla. In a separate bowl, whisk together the flour, baking powder and baking soda. Dump this dry mixture into the wet mixture. Stir in chocolate chips. Chill the dough. Then, make little dough balls and stuff each ball with caramel. Chill again for a few minutes. Bake and enjoy! In a mixing bowl cream together butter, brown sugar and granulated sugar. Add the egg and vanilla extract and mix thoroughly. In a separate bowl, whisk together the flour, salt, baking powder, baking soda and collagen peptides. Dump the dry mixture into the wet mixture and mix until just combined. Cover the mixing bowl and refrigerate for 30 minutes so that the dough is easier to handle. Scoop out a small portion of the cookie dough and roll it into a ball and then flatten it on the palm of your hands. Place a small caramel candy and some cashews in the center. Then, roll the dough into a ball and place it on a cookie tray lined with parchment paper. By the way, it really helps to wear disposable plastic gloves in this step since it prevents the dough from getting warm and sticking to your hands. Place this tray in the freezer for 5-10 minutes. Do not skip this step or else your cookies will spread while baking. Then, remove the trays from the freezer and bake at 350 degrees for about 10-12 minutes or until the cookies are golden brown and firm along the edges. Let these cookies cool down to room temperature before digging in! That flavor combo- you’re killing me! Caramel, cashews, & chocolate. To die for! hahaha! Gotta love chocolate and caramel together. Can you leave the dough refrigerated for longer? Yes, that shouldn’t be a problem. Hi, what size/brand caramels did you use. Also how an cashews (nuts) did you place in the middle of Center. How large should I roll each ball of cookie dough? If you are making big cookies, use a whole caramel candy (I used Werther’s soft caramel). 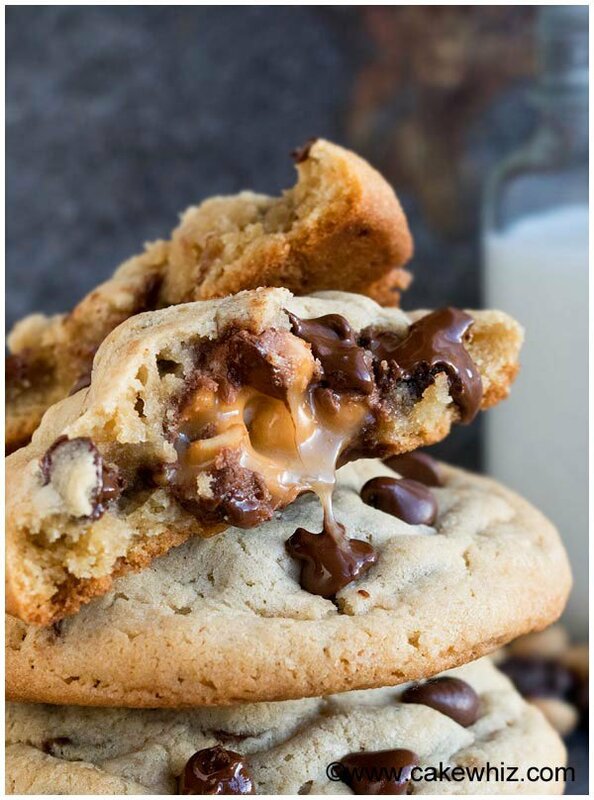 If you are making smaller cookies, cut the caramel in half and use half in each cookie. As for cashews, that’s a personal preference. Some people add 1-2 whole cashews. I like to roughly chop them and add a little less than 1/2 tbsp in each cookie.